Dec 10 Parks Board Meeting - Marina Concerns Recognized! Throughout 2018, Members have campaigned against the 8% rate hike that was enacted at the November 2017 Park Board budget meeting, and the overall 30% rate hike that was threatened. Without our efforts it is safe to assume that we would have been hit with at least another 8% hike this year; maybe 10% if they had received no push-back. Prior to the December 10th budget meeting, we sent a letter to the Commissioners and Staff protesting this gouging, and eight members spoke against fee hikes, deteriorating conditions, and loss of services. Many more members came out to join the audience. Marina members truly dominated the speakers agenda at the meeting - what a fantastic turnout! As it turns out, we learned that the plans for another 8% increase had been dropped, instead only a 2% increase (consistent with inflation) was proposed. Following a proposal by Commissioner John Irwin, the proposed fee increase of 2% was reduced to 1%, in recognition of some of the difficulties (including the delayed construction project) at Burrard Civic. This is a very good outcome - first the return of the 8% increase was chopped down to 2%, and now down to 1%. True, it's not zero, or a reversal of the big fee hike of last year, but it is significant nonetheless. Moreover, the recognition by the new Board that there is "work to be done" to improve things at the marina, sends a strong signal to the bureaucracy that the "status quo" is no longer acceptable. Heather Civic Marina patrons will also benefit from this reprieve, since their fees are pegged to ours, so if you know anyone over there you could let them know that BCMCA Members are saving them quite a lot of cash. Other marinas tend to follow Burrard Civic's pricing too, so it will be interesting to follow this in the marina market. At 14:14, Commissioner John Coupar asked for an update on capital spending projects at the marina. Mr. Jackson said the majority of work is complete, which is technically accurate for the "upland works" water and electrical supply, but a sizable part of the dock replacement phase remains far from complete. At 17:14 the first of the marina patron speakers starts. There was a 5 minute time limit on each. Some compelling arguments were made in favour of establishing a Contingency Fund (similar to what golf courses have), which would go a long way towards better long-term planning for capital improvements. It was also good to see many Commissioners ask many questions about marina issues. We came away from this meeting with more than just a reduction in the rate increase for next season, We have also garnered the attention of the PB Commissioners and the Director of Finance. They are now aware that marina members are highly displeased with the previous year's 8% rate increase and the plan to continue with additional hefty hikes. Commissioners have agreed that a meeting to discuss appropriate fee structure should be set up between marina members and Parks Board staff to better understand the discrepancy between Parks Board rate calculations and our own findings. Meetings to begin in January. Following the meeting, Commissioner Camil Dumont has requested the opportunity to visit the marina to see first hand it's condition. We plan to meet sometime in January. We welcome increased interest in the marina from the other commissioners as well, and hope to build new relationships and understanding. So there it is for now, the hard work we have put in the last 13 months is at last showing results. Our hope is to bring honest value back to the marina for your moorage dollar, and restore our enjoyment of the marina. We would like to thank the Directors of the BCMCA, the members who spoke at the meeting, those who wrote to the Parks Board, and anyone else who has made the Parks Board aware of our concerns...kudos to you all! Every little bit helps! As you may recall, at this time last year, the Parks Board claimed that we were 30% below market rates, thus justifying an 8% rate increase for 2018, with further increases to follow. The graphs supplied in the presentation to the Board did not name any marinas, and several Freedom of Information Act requests were needed to get further information. Even then, the picture of how they arrived at their conclusions is still not complete. 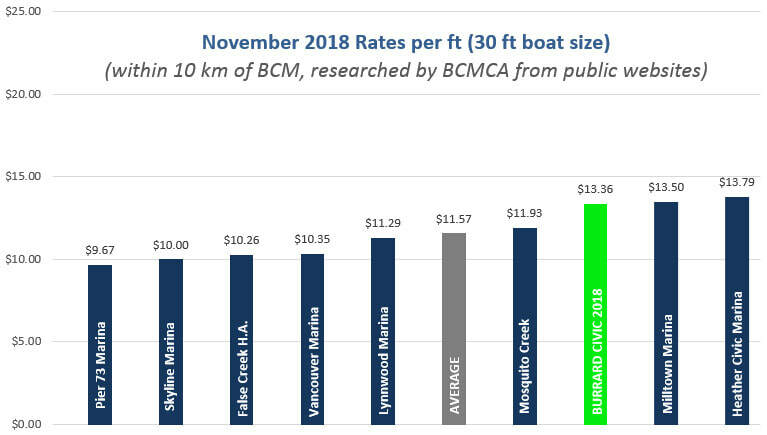 Our own research as of Dec 2017 showed that Burrard's rates were already 19% higher than the Lower Mainland average rates, or 10% higher than the average of all comparable marinas within 10 km of Burrard Civic. Within a reasonable distance of Burrard Civic (10 km). This would include some marinas on the North Arm. Confusingly, the Parks Board includes Milltown, but excluded others nearby, and also included Reed Point Marina, which is over 18 km away, and Thunderbird Marina, over 13 km away. Using the above criteria, the BCMCA has again researched marina rates to see now where we stand. Our findings as of Nov 1, 2018, now show we are 13% above this market average. See graph below. Note: Heather Civic's fees are always based on Burrard's fees. Heather's fees also went up by 8% last year. Now that the municipal elections (and particularly the Vancouver Parks Board) are upon us, the BCMCA would like to make clear some of our political goals. ENVIRONMENT: A clean and safe environment for boaters at the marina. FAIR VALUE: Fair value for fees charged, not an ongoing reduction in services and conditions, while rates increase at more than double the inflation rate. CAPITAL PLAN: A long-term self-funded capital plan for necessary infrastructure repair and upgrades, not being shut-out when capital plan requests are made only every 4 years. ORIGINAL VISION: That the marina fees and policies be consistent with the original intentions of a Parks Board operated marina as envisioned in 1963, namely that it will serve "small boat owners of average income". MARINA MANAGEMENT: That boaters have a voice in how marina fees and policies are set, in regular, open, and transparent meetings with the Parks Board. PROMOTE BOATING: That the Parks Board recognizes that boating in this maritime city is an activity which should be promoted through appropriate use of the marina. 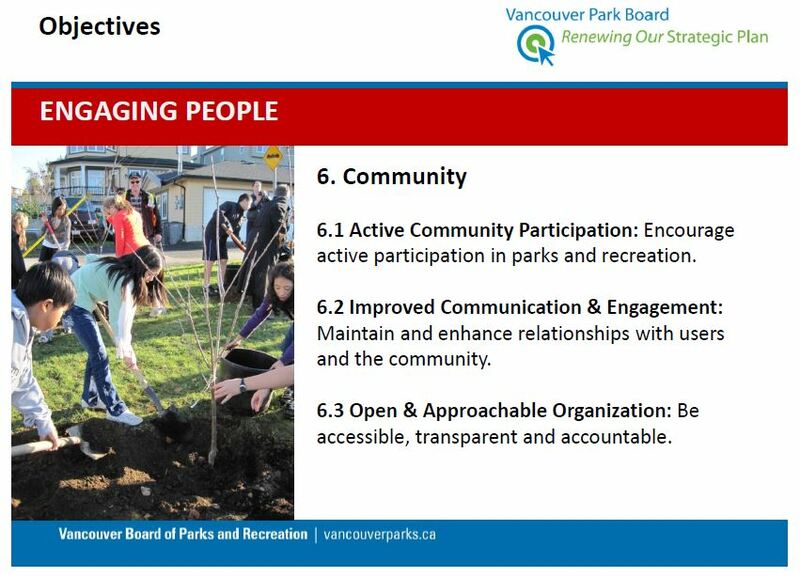 To ALL Candidates running for Parks Board - do you support these goals? ENVIRONMENT: Too often in the past, infrastructure at the marina has been allowed to deteriorate to the point where it becomes a safety hazard. FAIR VALUE: Historically, marina fees have increased at more than double the inflation rate, and consistently well above the increases set for patrons of other Parks Board programs. Marina customers now contribute over $1 million annually in excess of marina operating costs, which is diverted to other programs. The BCMCA promotes fair treatment and value for fees charged. CAPITAL PLAN: Since its construction in 1964 there has never been a capital plan and history shows the marina is shut-out when Park Board capital plan requests are made every election cycle. (now every 4 years). As a result, Burrard Civic Marina has the lowest standard of maintenance of any marina in the area. The BCMCA promotes a conventional self-funded capital reserve similar to the contingency plan already in place at city-run golf courses. ORIGINAL VISION: The stated intention of the marina’s founders in 1963 was to “serve small boat owners of average income". The BCMCA promotes the principle that small boats continue to have a home at the marina, and that fees be consistent with this founding statement. MARINA MANAGEMENT: In 2017 and 2018 marina issues were deliberately excluded from the Park Board agenda, and any attempts to discuss the 30% rate hike at Board meetings were stone-walled. Do you agree and support that boaters are also citizens who should be welcome and actively invited to present their concerns to the Park Board? PROMOTE BOATING: The Parks Board has put much effort into promoting non-motorized boating, but without much consultation or involvement of the marina community. The Parks Board's stewardship in this maritime city should signal its commitment to all forms of water sports, sport fishing, sailing, and all the many facets of boating, without excluding any user group. We have started a petition titled "Vancouver Park Board making boating a recreation for only the wealthy." and we hope you will add your name to it. It is very important for all members of the BCMCA to sign the petition and let other boaters in the marina know that the Park Board staff are not able to realistically justify the 8% increase for 2018, let alone a 30% over 3 years. All members of the boating community, especially those at Heather Marina, are also welcome to sign. On Friday March 9th, 2018, the letter below was sent to all Commissioners, addressed individually to each. Several Commissioners had responded previously that they wished to see the information we had prepared. Our presentation of March 2 to VPB staff was included in the letter. As of Friday March 16th, NO RESPONSES have been received. After 3 months of delays in response to our FOIA requests, the Burrard Civic Marina Community Association has now established that your decision to accept staff’s recommendation to increase rates at Burrard Civic Marina by 8% and 30% over 4 years was based on incorrect information presented at the Special Meeting of The Board on November 14th, 2017. Our research proves that the staff research into so-called “comparable marinas” was flawed on many levels. For example, mega-yacht, commercial, and relatively new marinas are definitely not “comparable” yet they were all thrown into the mix. In fact, when compared with truly "comparable marinas", Burrard’s rates are already above the average, although there is no other marina where many boats and docks are stranded on the sea bed at low tide, so direct comparison is really impossible. Commissioner, I would like to personally present our research to you and trust that The Board will welcome this opportunity to engage with the marina community to reconsider our fees in accordance with the services the marina provides, and a fair, unbiased evaluation. This is urgent as the 8% increase is due to come into effect on April 1st. Thank-you in advance for your assistance.